Why is This Postcard Censored? The issue includes a number of news columns, classified ads, book reviews, show reports, and articles of current Society business news. Access to the electronic version of this issue is password-protected. Information on the electronic files can be found at: the MPHS Bulletin electronic version links page. An Index of the War Cover Club, The War Philatelist and the Military Postal History Society bulletins is online. There is a special webpage with content of the Bulletin Index for the years 1937-2004. 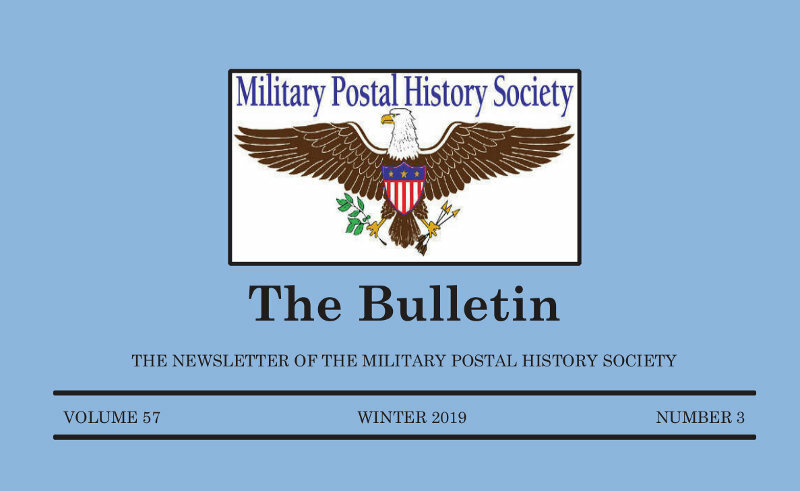 The Military Postal History Society began as a small group of collectors meeting in May 1937 to form an informal War Cover Club and to provide information on military markings in a "War Cover Club" column in a Chicago publication called Postal Markings. The club was formalized by adoption of a Constitution at a meeting in April 1938 during which a member's publication called "The War Cover Philatelist" was selected as the club's official bulletin. The need for additional coverage of newly emerging World War II resulted in a second official club publication called "The War Cover Club Bulletin" which appeared until mid-1942. Both publications ended during World War II due in part to restrictions on release of military marking information. The War Cover Club Bulletin reappeared in 1946 as an independent publication and continued until the name of the club, and its publication, was changed in mid-1991 to the Military Postal History Society. The quarterly issues of the Bulletin became identified by season beginning with Winter 1994. This document presents a listing of the articles both long and short, which have appeared in these publications during the period from May 1937 to the end of 2004. Copies of articles of interest which have appeared in the War Cover Club Column and in the War Cover Philatelist can be provided by the American Philatelic Research Library. Copies of articles from the War Cover Club Bulletin and the Military Postal History Society Bulletin can be provided by the Society. There is a separate web page that provides details on ordering copies of previous bulletins .